Our society is saturated with GPS, or Global Navigation Satellite System (GNSS), applications. GPS is the first GNSS and it is operated by US Air Force. Most people are not aware of the fact that GPS was developed and is run by the military. A reduced quality signal is released for civil use. After Europe decided to build their own GNSS, called Galileo, the US Air Force decided to released an improved signal. It was and is a matter of competition. 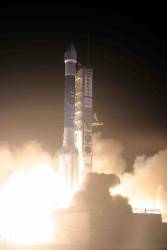 On August 17th 2009, the US Air Force launched the last satellite that will improve the GPS service even more. Again, I think this is a competitive move - for the benefit for all of us as GPS is used around the world. Some of these systems are already integrated (GPS and GLONASS) and there is a close cooperation between GPS, GLONASS and Galileo.